According to the stories of Sir Arthur Conan Doyle, Sherlock Holmes, while battling his arch foe, Prof. Moriarty, was lost in the Falls at Reichenback and presumed dead, though his body was never recovered. Upon his return to London four years later, Holmes informs Dr. Watson that he had been traveling Europe and the Far East under the disguise of a Norwegian named Sigerson. In a novella length adventure, I.A. Watson delves deeper into those missing years, revealing who it was that accompanied the Great Detective during those lost years. This is one of four all new stories that fill this 10th volume of Airship 27 Productions’ best selling series. 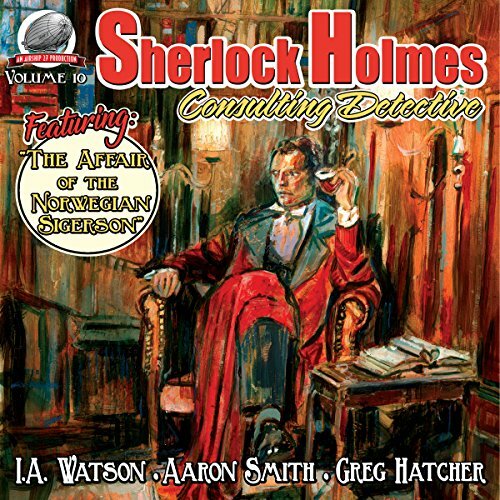 Writers Aaron Smith and Greg Hatcher offer up their own unique tales; among them a clever burglar who robs from the rich while they attend theater performances and in another, Holmes and Watson come to the aid of a former Baker Street Irregular accused of murder. Once again three of the finest New Pulp writers breathe life into Conan Doyle’s classic characters and spin exciting, suspenseful tales of mystery and intrigue. Sit back, pour yourself a brandy and prepare to enjoy a truly wonderful collection of stories starring the one and only Sherlock Holmes—Consulting Detective.